The T56 GMC is an American tier 3 tank destroyer. 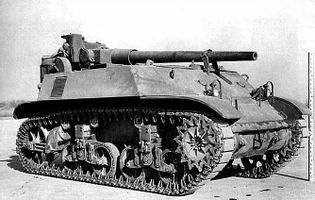 Development of a 3 inch self-propelled gun on the M3A3 Stuart chassis started in September 1942. Trials on the Aberdeen Proving Ground in November demonstrated that the gun was too heavy for the light tank chassis. Never entered mass production. 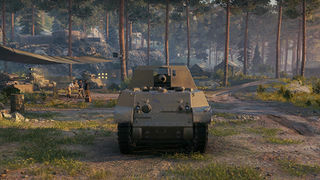 The T56 GMC recently replaced the T82 HMC, which is now a tier four arty, as the tier three TD. It has decent mobility and a good choice of guns. As such it plays as a mobile sniper, moving after only a few shots. But with pros always come cons, and the T56 is no exception. The T56's view range is far from outstanding (It is tied for the worst), and the armor, while it looks decent on paper, is non-existent. 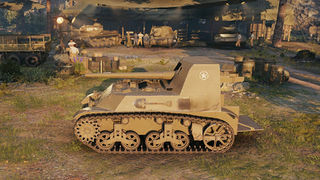 Even so the T56 GMC can be very fun and enjoyable to play, and can easily compete in tier five matches. The T56 GMC leads to the T40, and the M8A1. 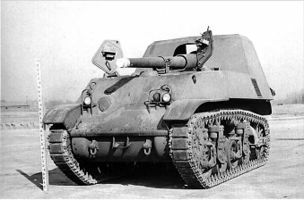 The T56 Gun Motor Carriage. The T57 Gun Motor Carriage. 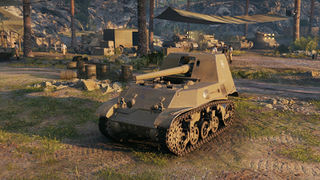 It should be noted that this vehicle used to be in the game as the Tier 2 artillery but has since been removed. * The T56 was only ever fitted with the 3 inch gun. This page was last modified on 14 January 2017, at 23:24.